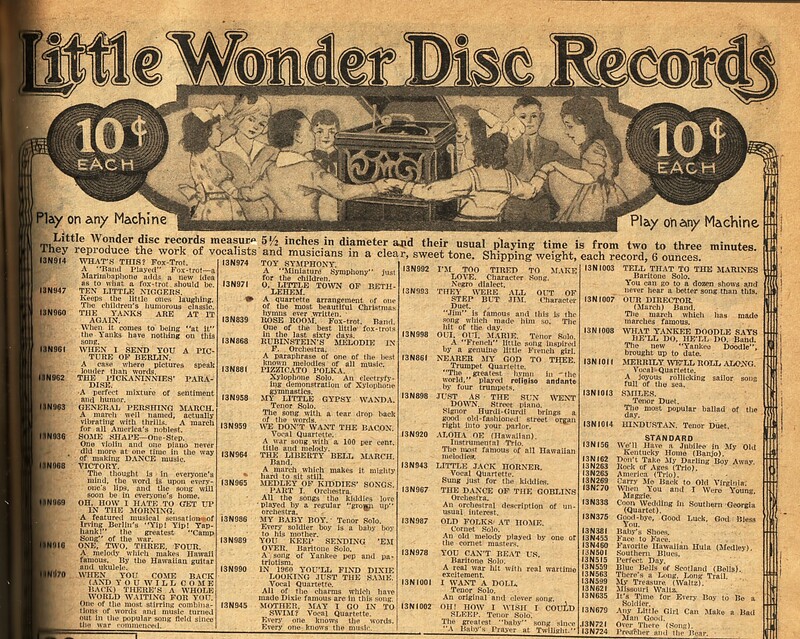 Little Wonder records and, later, Bubble Books were advertised in several national and local mail-order catalogs as a way to expand the public's awareness and purchase options.- I have seen these listed in catalogs from Sears, Roebuck and Co., Montgomery Ward & Co., and The Charles Williams Store Inc., and these are shown below.- If you know of other catalogs that contain listings for Little Wonder records or Bubble Books, please contact me. 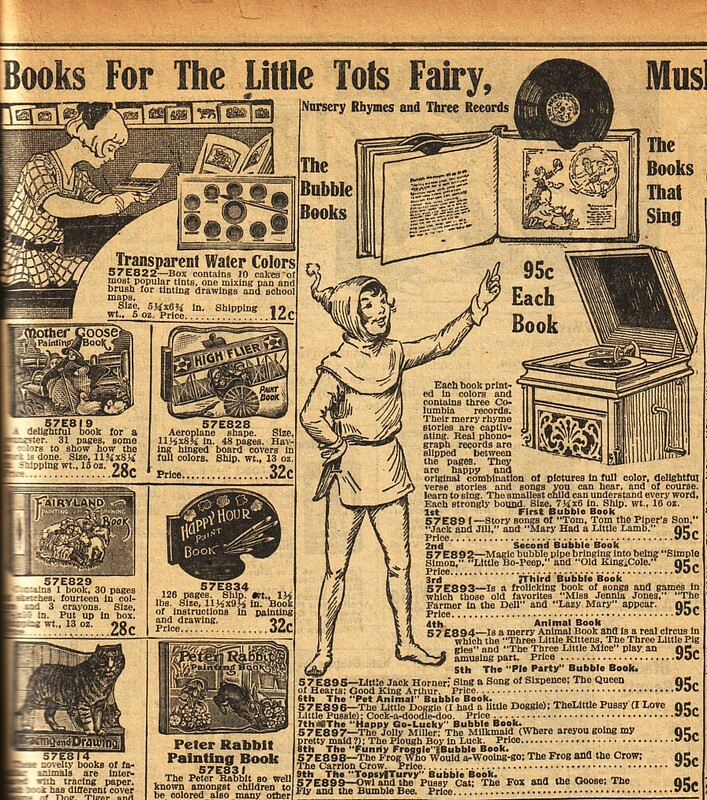 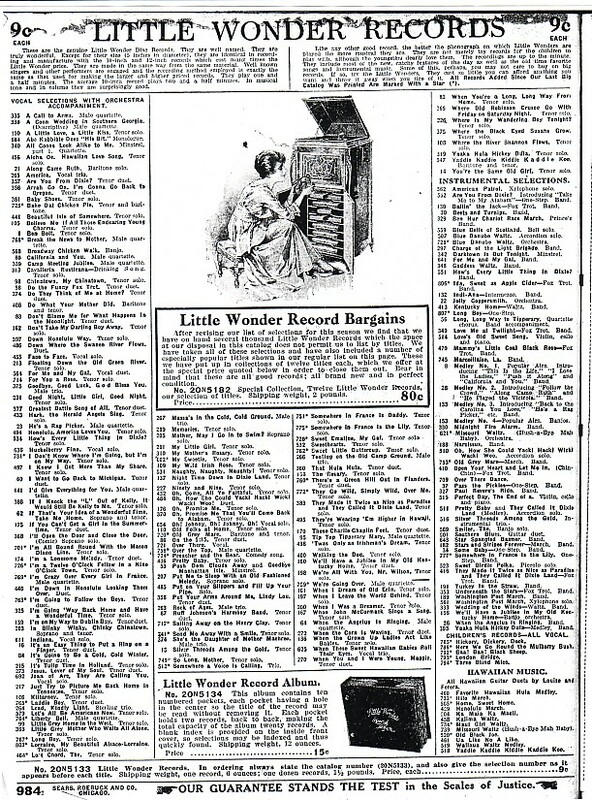 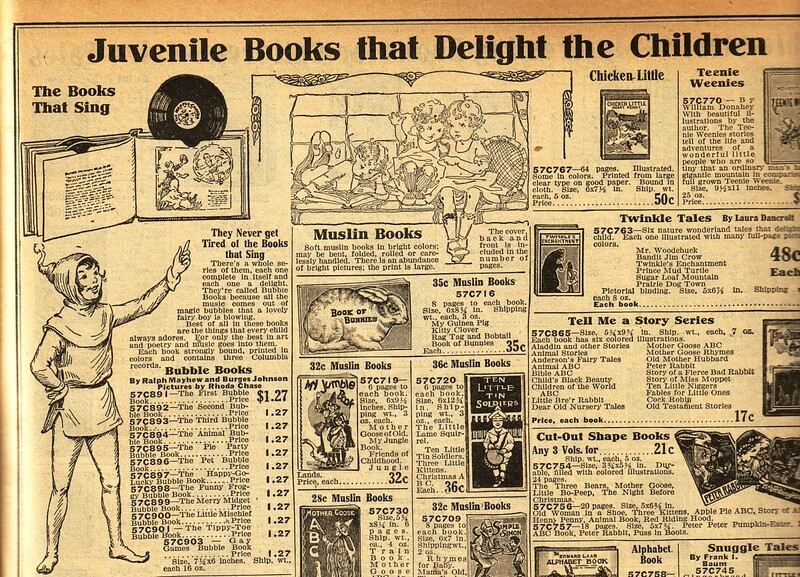 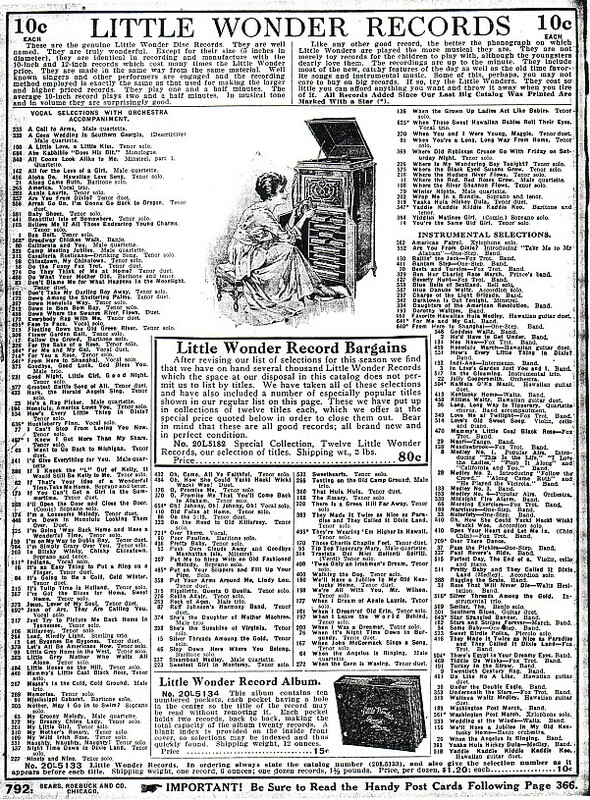 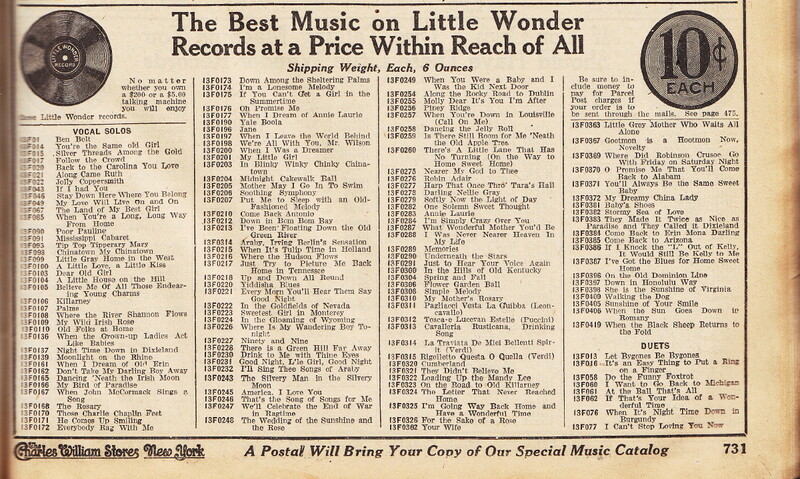 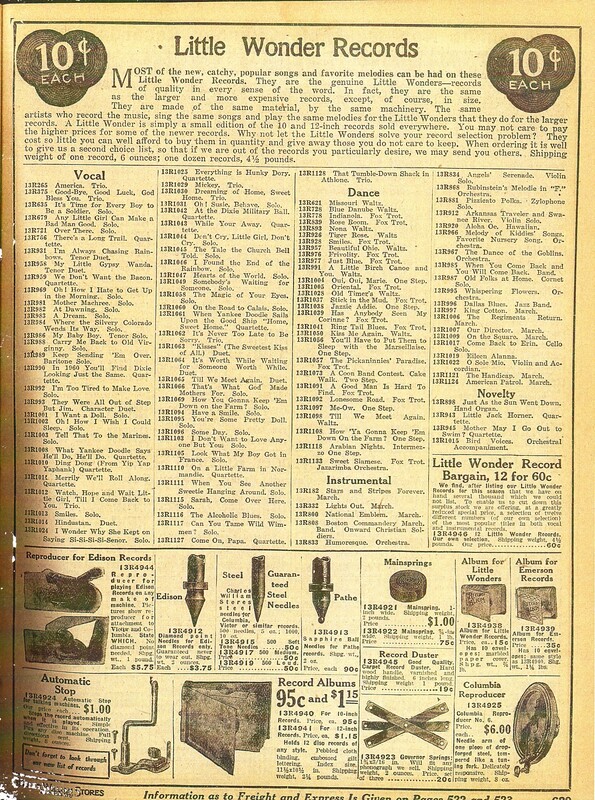 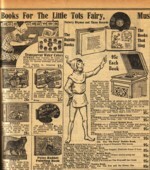 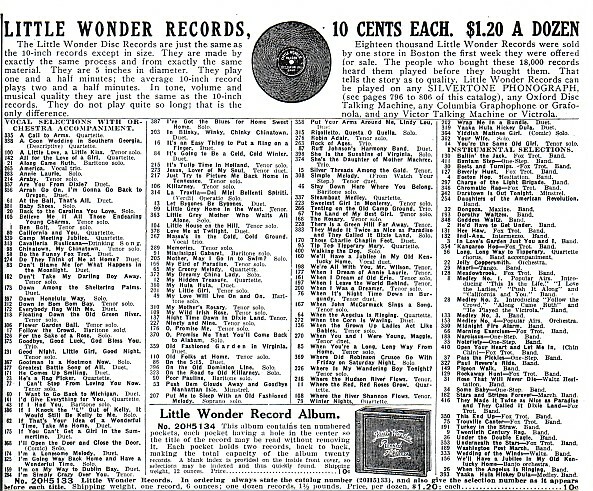 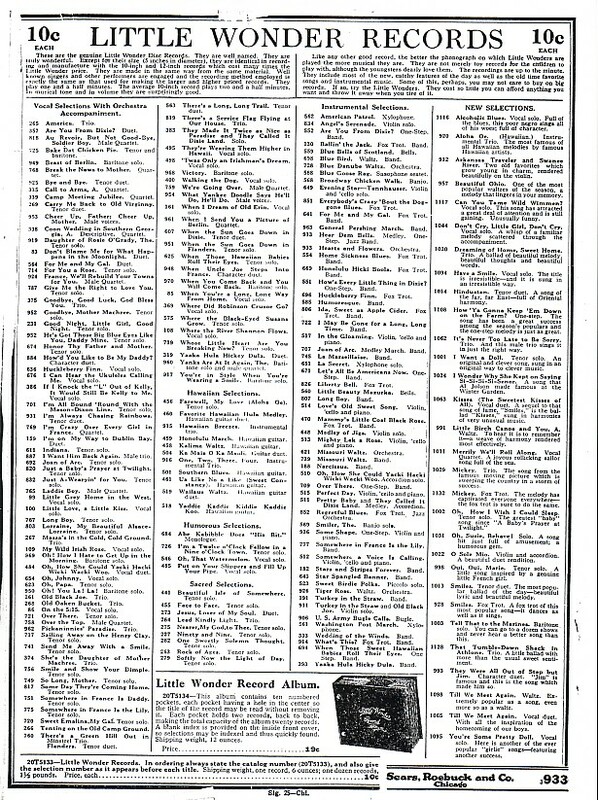 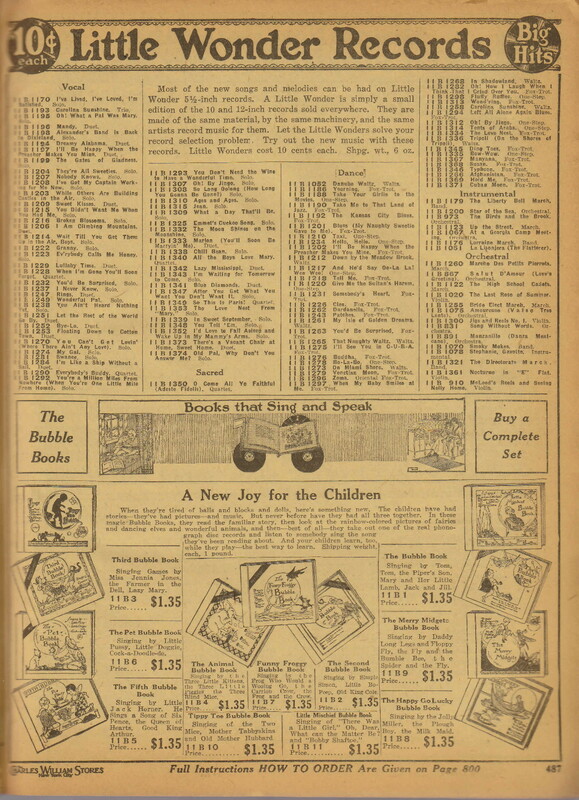 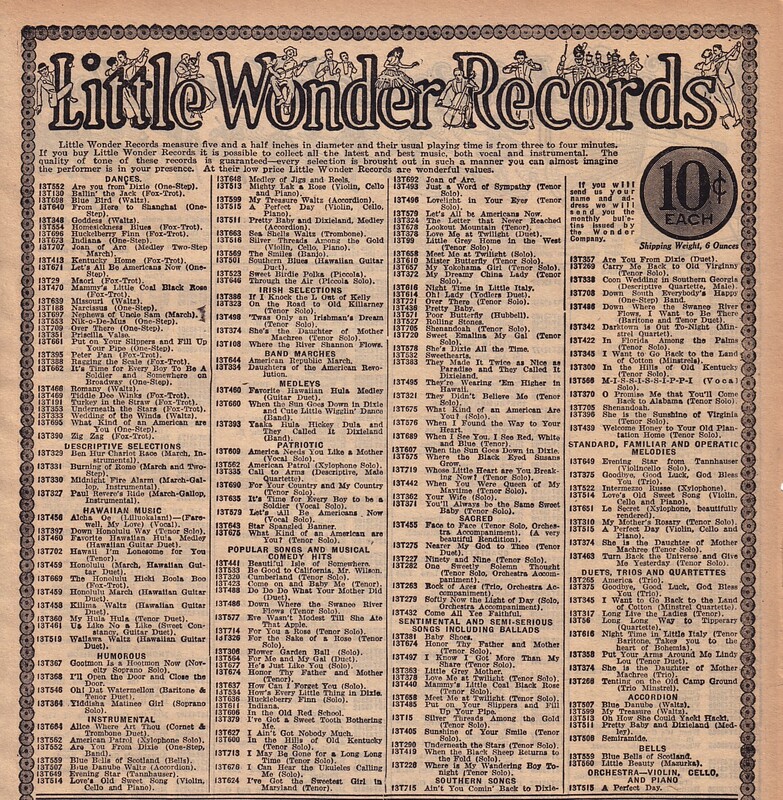 Sears, Roebuck and Co. mail-order catalogs featured Little Wonder records for sale from 1915 through 1921, and Bubble Books in 1918.- Scans of the entries from all of these catalogs are shown on this page. 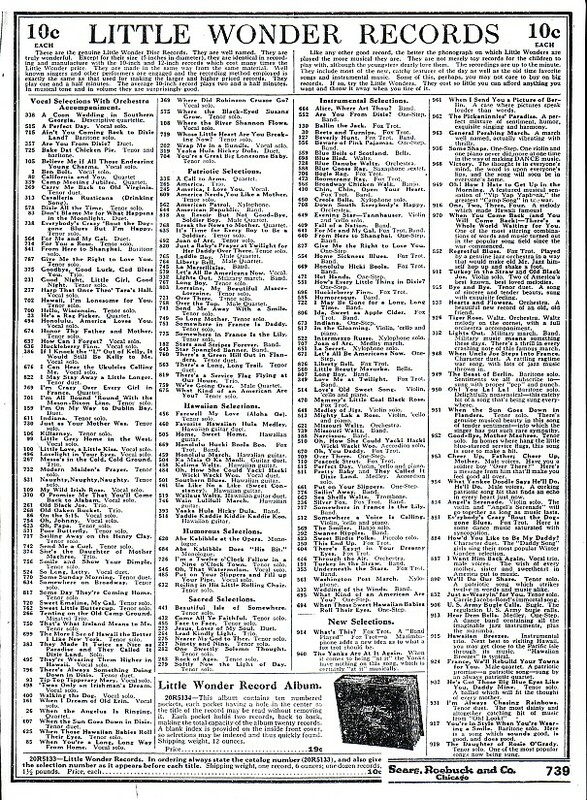 Between 1915 and 1919 the record listing expanded -- from a quarter-page in early 1915 to a third-page in later 1915, a half-page in early 1916, and finally to a full-page in late 1917 through 1919.- In early 1920, paralleling the fortunes of the Little Wonder Company, the listings were reduced to a half-page and, by late 1921, the listings were where they started, at a quarter-page.- No listings appear from 1922 on. 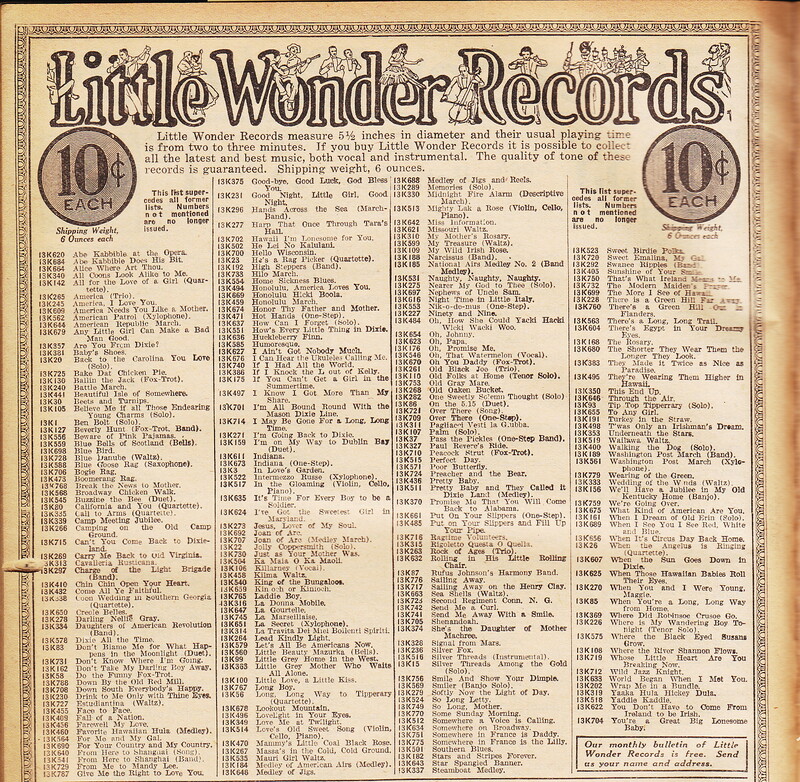 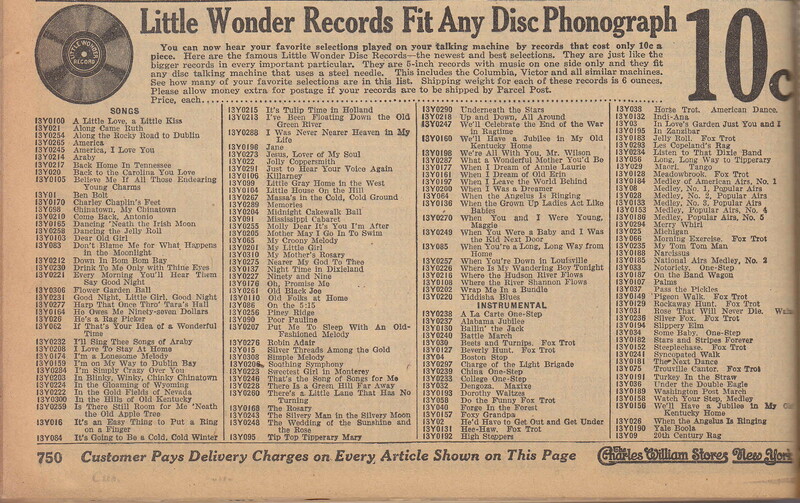 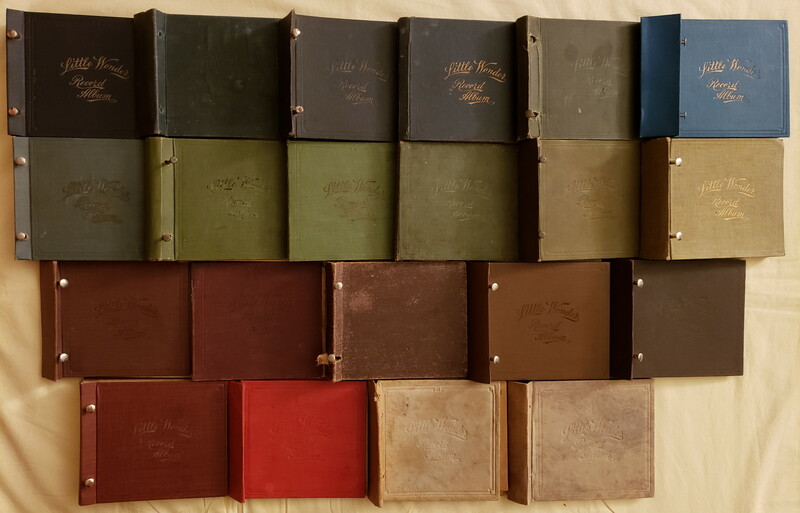 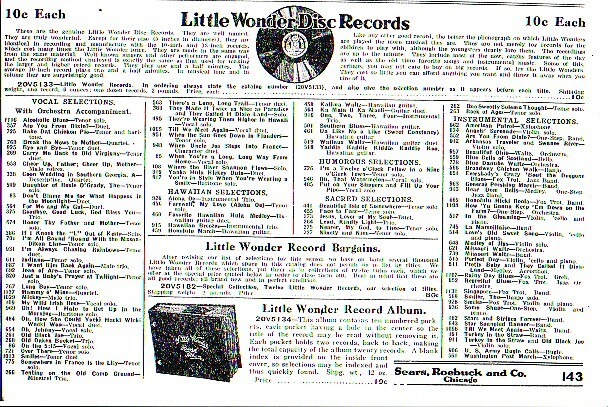 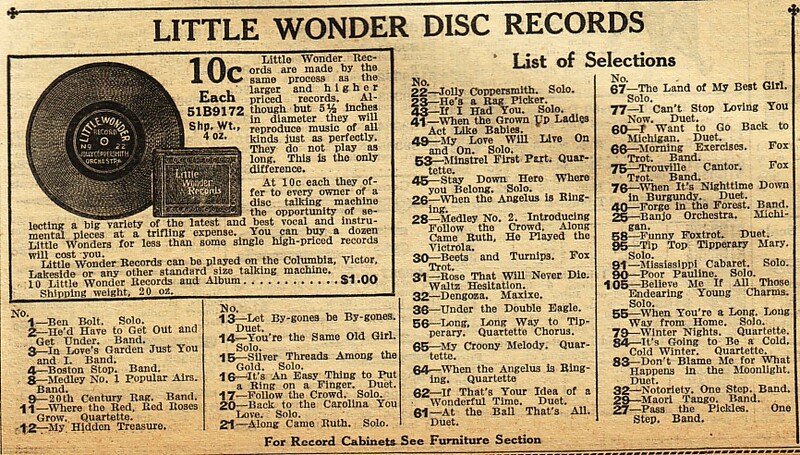 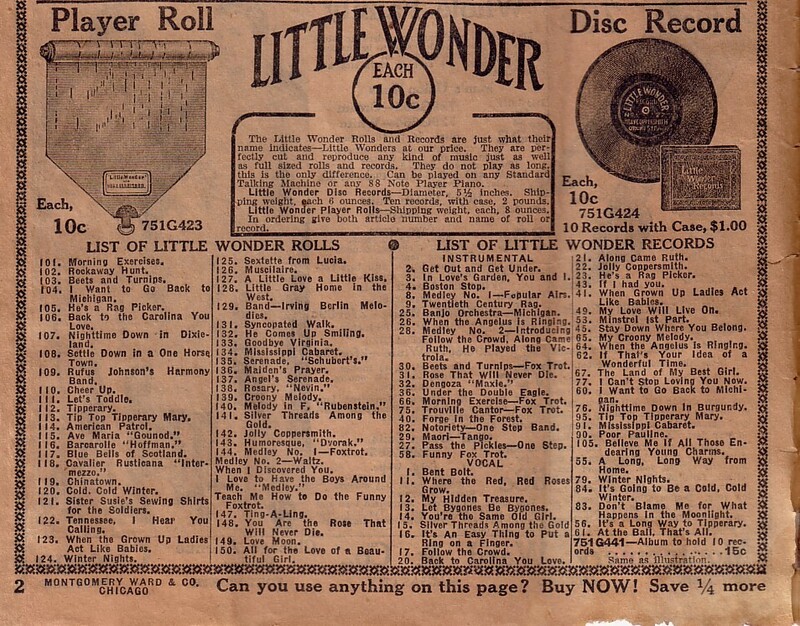 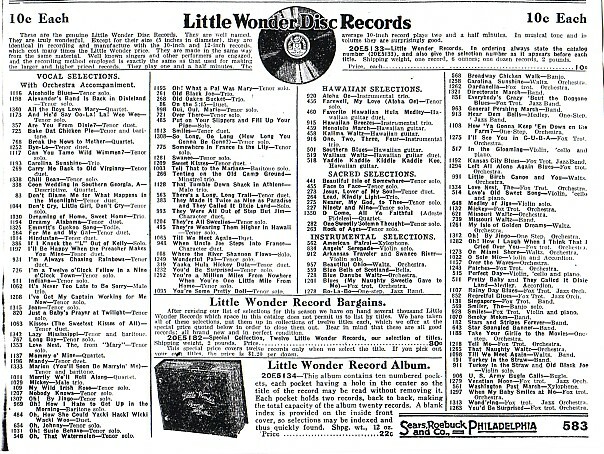 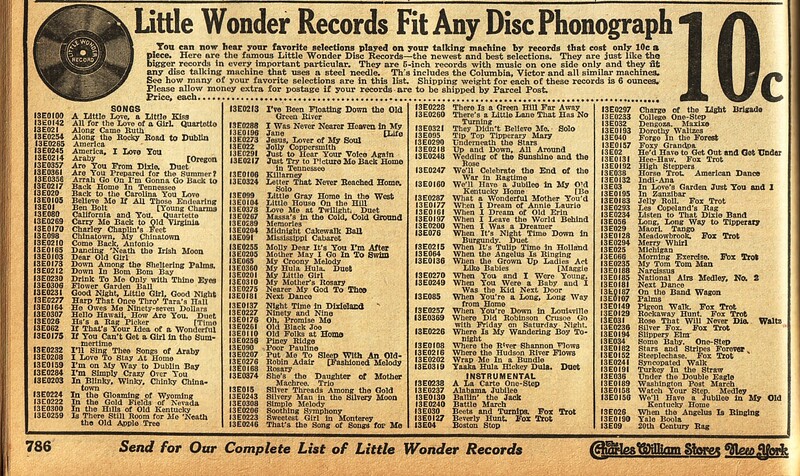 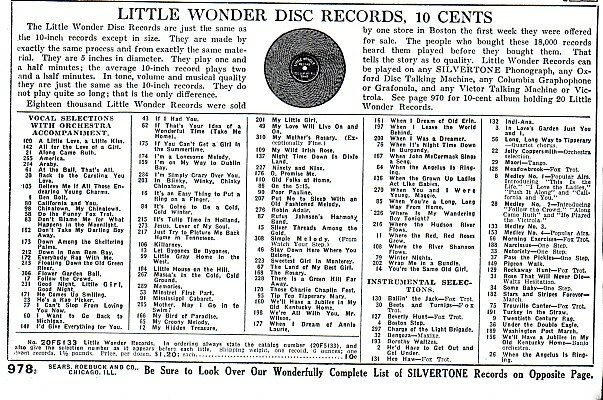 Some of this information was used to prepare the Little Wonder discography, since performers and medley songs are not printed on the label.- In both 1919 catalogs, new selections were grouped into a separate section where the records were described and touted. 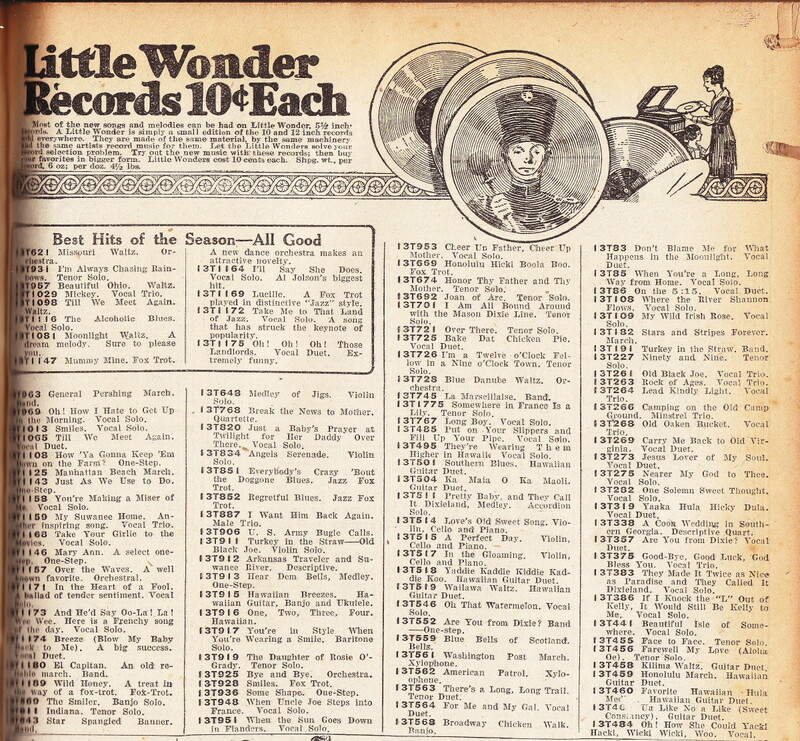 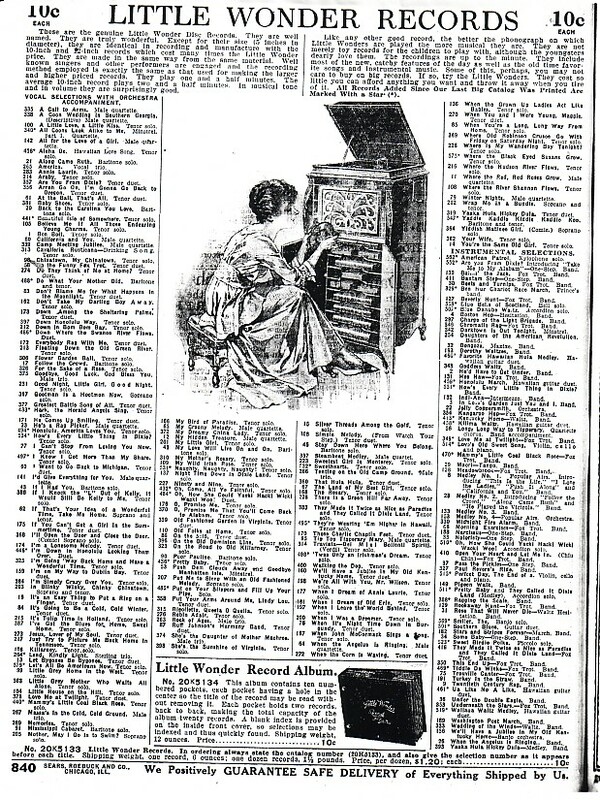 The first record listing (from early 1915) contains several entries that do not correspond with the information from the records themselves (such as record numbers and titles), suggesting that the catalog was printed before the records were available. 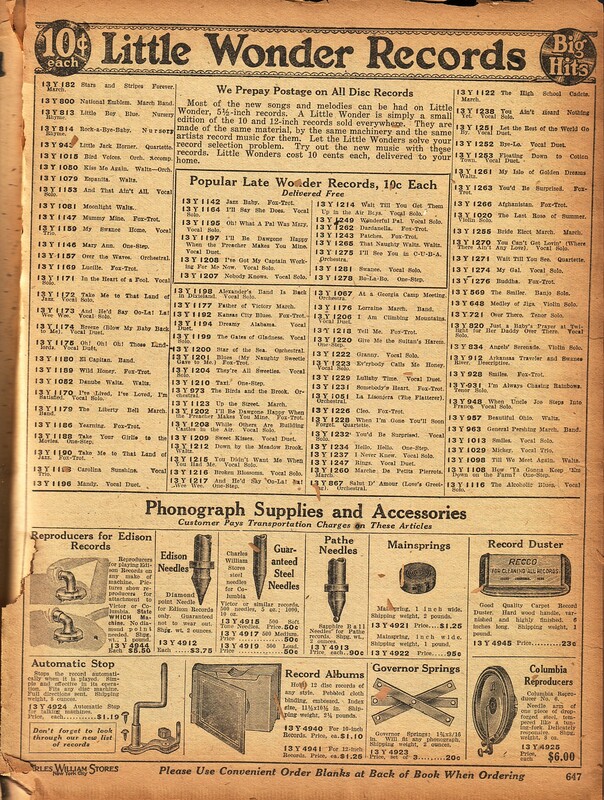 Later catalogs corrected these earlier errors although these occasionally made others (such as record #504 listed with the wrong title in the late 1918 catalog). 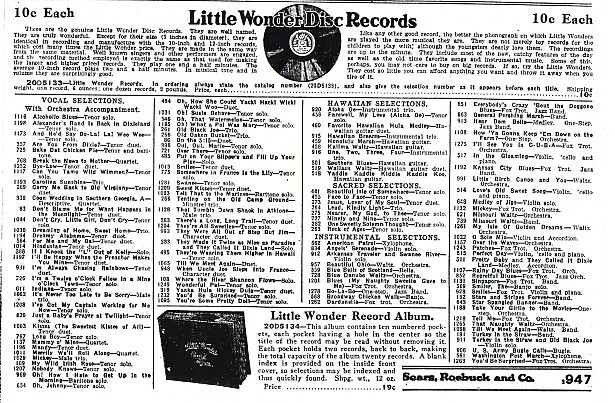 Record albums that could hold the Little Wonder records (which were sold without sleeves) were advertised in most of these Sears catalogs as well.- I have collected many albums in many different colors that look like those featured in these catalogs, but I have no way of knowing whether these were purchased from Sears. 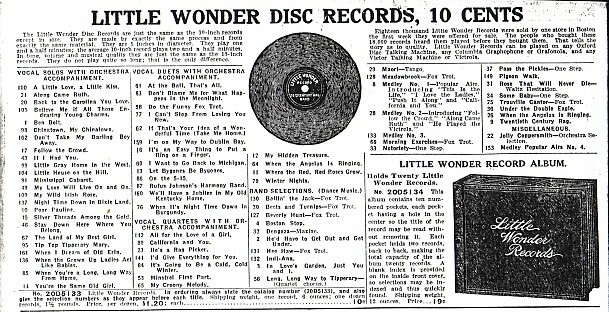 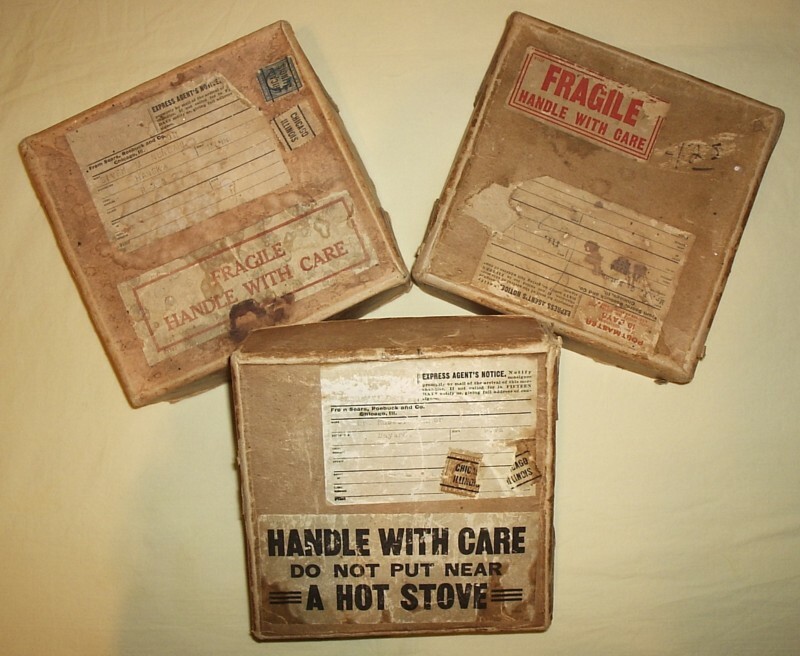 The records were shipped by Sears in boxes of just the right size to hold a dozen. 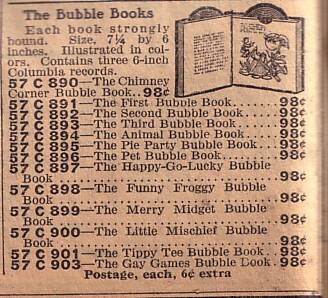 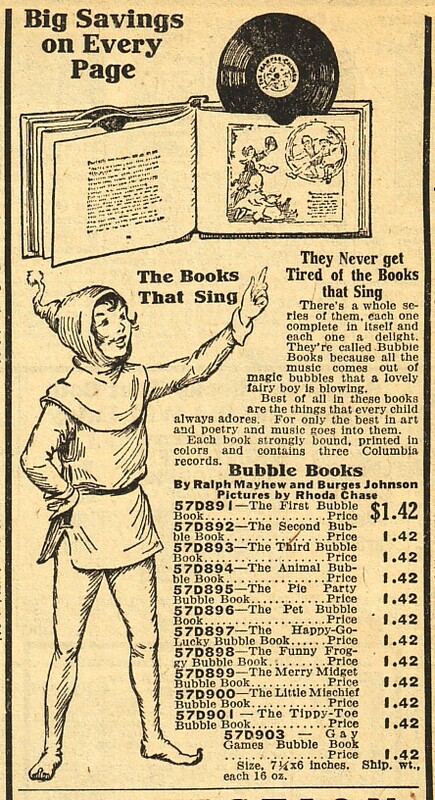 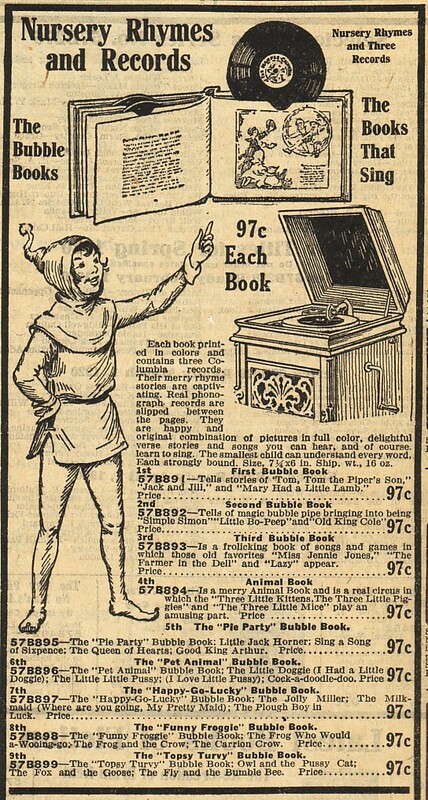 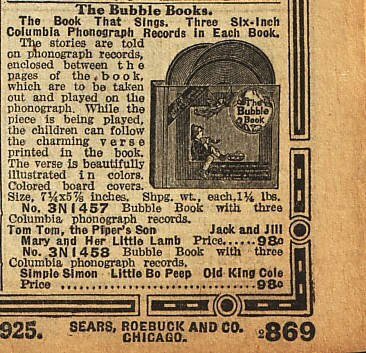 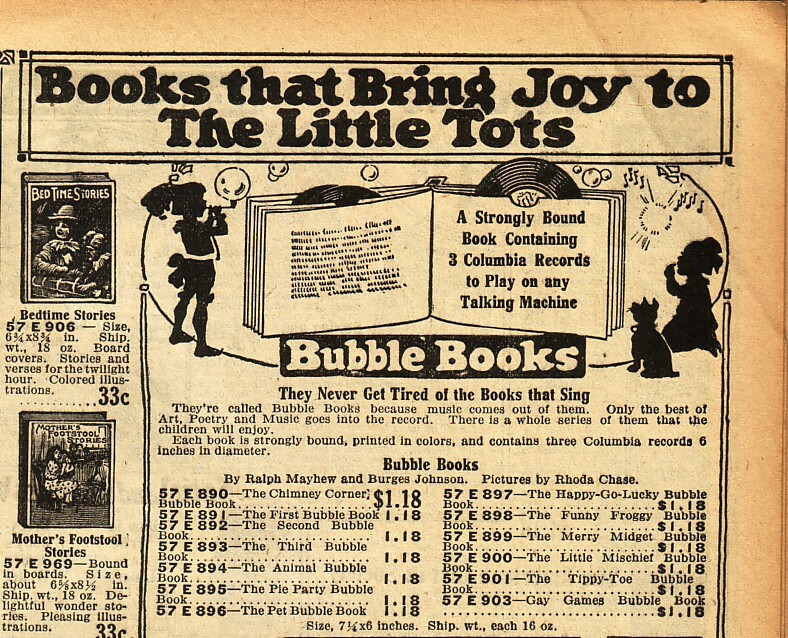 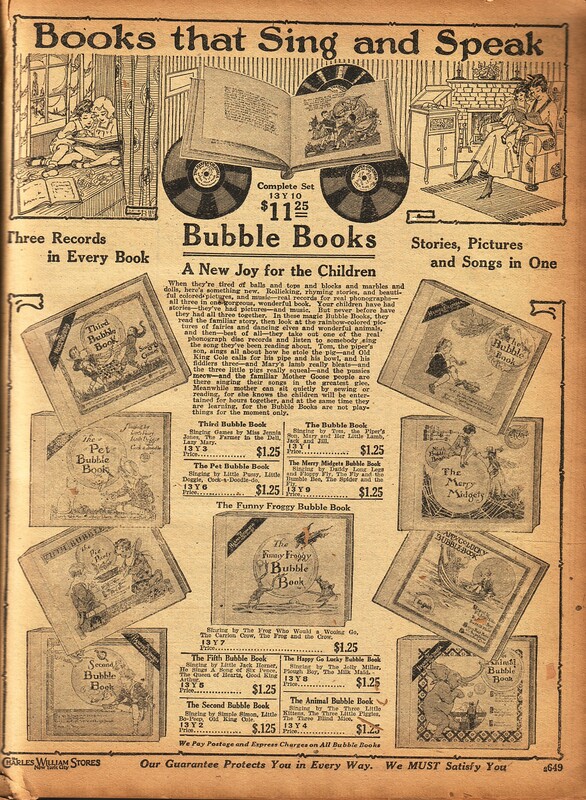 Montgomery Ward sold both Little Wonder records and Bubble Books, although not in the same catalogs.- Note that prices for the Bubble Books started at 95¢ in 1919, climbed to $1.42 by 1921, and then fell to 98¢ by 1922. 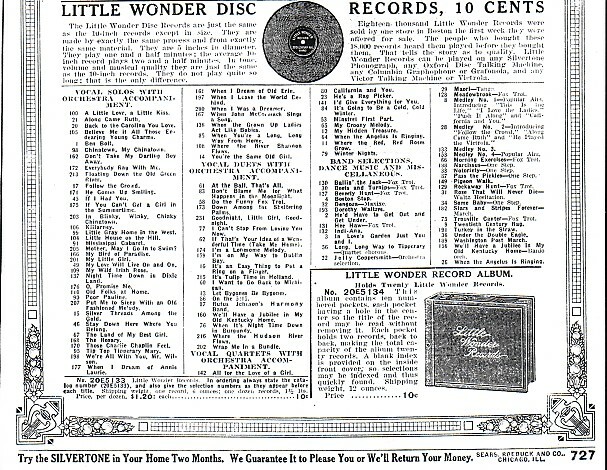 The Charles William Stores, located in New York City, carried Little Wonder records from 1916 through 1920.- In 1918, a catalog dedicated to Little Wonder records was created, but it is not known how this catalog was distributed.- The later 1920 and 1921 catalogs also included Bubble Books.- If you know something about the history of this store, which no longer exists, please contact me.